Former DfT economist Tom Worsley is to advise the Lords Economic Affairs Committee inquiry on high speed rail, ITS Leeds University announced. In February 2013 Peter Mackie, Robert Cochrane and Mr Worsley contributed evidence to the John Armitt Independent Infrastructure Review commissioned by the Labour Party. Some extracts from their submission can be seen below. We do not think it is self-evident that the UK is suffering from an infrastructure deficit with the consequence that ‘the economy falls behind’. That is a legitimate proposition which needs to be tested across the infrastructure sectors and compared with other known economic drivers such as human capital investment. As an example, the Review of Birmingham’s economy and its prospects carried out in 2005 indicated that businesses considered its national and international transport connectivity to be a major strength. The major weaknesses were poor educational levels in the population, poor levels of diversification into new industries and poor use of new technologies. The most economically vibrant and congested part of the United Kingdom is the South East, a region with a population and economic output exceeding that of some European countries. It has diverged rapidly from the remainder of the UK over the last twenty years and now presents some very specific problems which need integrated policies which may differ from those needed for the country as a whole. The Eddington Report’s maps show clearly that the major areas of congestion and lack of capacity on the road and rail networks are now and in the future in the South East out to about 50 or so miles from London. Evidence based policy making is vital. Strategies need to be developed on the basis of evidence which itself can be interrogated and cross-examined. Evidence means spending serious money on collecting data, maintaining databases and developing forecasting models which link supply, demand and outcomes. Our view is that most transport infrastructure schemes which lack consensual support would probably fail to happen under any institutional arrangements made by a democratic society. The Aire Valley Motorway, Archway, M11 Hackney Wick, Twyford Down and the Newbury by-pass are the via dolorosa of contested highway schemes and Stonehenge and Bexhill/Hastings are current examples of schemes which have been mooted and delayed many times. Roger Harrison‘s remarks about HS2 ‘return on investment’ (benefit-cost?) 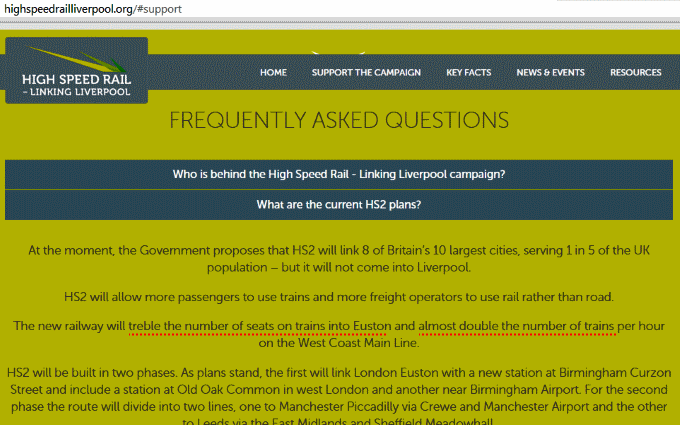 illustrate the HS2 blob’s propensity to simply make up numbers and ‘facts’. The recently-established High Speed Rail Liverpool campaign — apparently run by PR firm Kenyon Fraser with public cash from Merseyside councils — provides many examples of the phenomenon. Which of course, is complete nonsense. The government actually claims that HS2 is needed because it’s ‘not possible’ to ‘almost double’ the number of trains per hour on the West Coast Main Line. While the return on investment for HS2 in isolation stands at 4.8 : 1, add in a web of new local connections and this figure rises and rises. And mass rapid transit systems like light rail are in themselves very efficient creators of jobs and growth, even without being routed into HS2. This misinformation, and copious similar nonsense cooked up by ‘usual suspects’ like Pete Waterman, Ed Cox, and Lilian Greenwood, can be found in ‘Integrated Cities: INTEGRATING THE TRANSPORT NETWORK INTO HS2‘, produced by the French Keolis company. Keolis, a member of Greengauge 21’s “Industry Leaders Group”, is a French state-controlled concern which has been handed millions of pounds by the British government to operate GB rail franchises. Devizes MP and recently appointed rail minister Claire Perry has ‘never understood the argument that all the HS2 railway would do is make the country more London-centric’. […] given the house price differences across regions – if you could live in the Midlands or the North and commute rapidly and smoothly to a job in London, would you not be tempted? So, in the view of the minister, a policy of building a high speed railway from 3 provincial cities to the capital, and ‘encouraging’ people to commute long-distance, is not London-centric. Kent commuters using HS1 pay steep fares, yet still receive high public subsidies (~£70 per week from Ashford). If the passenger-kilometre subvention for HS2 was at the same level as for HS1, each person commuting from Leeds or Manchester would be receiving an ‘encouragement’ of £200+ per week, from public funds. The St Martins Queensway tunnel, one of several examples of substandard urban design to be found in Birmingham city centre, is little more than ten years old. How and why the developers of the Bullring shopping centre were able to take control over so much public space around St Martin’s church, remains a mystery, but the mess they created is plain to see. The state of St Martins tunnel was of little interest to Birmingham city council and Centro until the HS2 rail project was announced. The government decreed that the high speed station should be located at Curzon Street, remote from the city’s main station at New Street, and so the direct route between the two would entail walking through the tunnel. Centro adopted a “bipolar” stance, sometimes claiming that the remoteness of the two stations wouldn’t matter at all, and then proposing Metro links and cable cars to bridge the gap. Reality appears to have bitten, at least in terms of understanding what funds are actually available to improve the link between Moor Street and New Street. According to GBSLEP’s “One Station Strategic Economic Plan/Local Growth Fund Transport Scheme Business Case“, ‘One Station’ is focused on refurbishing the existing tunnel at a cost of £7 million, with about 90% of the bill being picked up by the public sector. The visualisations in the business case are not very clear, but it seems that the ‘One Station’ is, in essence, little more than a painting-and-decorating job. Short of demolishing the Bullring complex, there is no real way to fix the underlying design shortcomings. The business case has a higher-than-average nonsense quotient, including claims that One Station ‘addresses social exclusion’ (because the city centre happens to lie in Ladywood ward, one of the most deprived areas of the city) and ‘the lack of streetscape quality’. Of course, deprived people actually living in Ladywood district, on the other side of the city centre, are not the beneficiaries. And fixing a few yards of narrow pavement outside New Street station would do nothing for the poor ‘streetscape quality’ just around the corner, in Moor Street and Park Street. UK government infrastructure planning requires a more “methodical approach” in place of announcing schemes such as the “£7 billion” High Speed 3 without any real background analysis. That’s the view of Olympic Delivery Authority chairman Sir John Armitt, set out in a Construction News article dated 23 July 2014 (paywall). […] Sir John told Construction News: “I’d argue that [proposals such as HS3] demonstrate the difficulty of today’s world, where we get these inspired ideas which are presented without any real background analysis. Given the way HS2 was plucked out of a hat by Andrew Adonis, one might expect Mr Armitt to be concerned about allocating £50 billion to a project having such unsatisfactory credentials. But in a July 2012 CN article (paywall), he didn’t seem to be much bothered about the quality of the analysis for high speed rail projects. […] Speaking to Construction News, the former Network Rail chief executive said France’s ambition to build 2,000 km of high-speed rail over the next two decades compared with the UK taking “16 years to build 150 km of HS2” reflected a “lack of maturity” around the infrastructure debate in the UK. As previously mentioned, HS2’s ‘construction headquarters’ in Birmingham is supposed to create ‘1,500 direct jobs’, and the whole project, ‘14,000 jobs’ in the city. Amusingly, in Central News’ coverage of the ‘headquarters’ announcement (21 July 2014), transport secretary Patrick McLoughlin said the jobs figures were “based on fact”, but GBSLEP’s Andy Street admitted that they “can’t actually be accurate”, and were “based on modelling” [2:32 in]. Adding to the confusion, council leader Albert Bore said “you would get a multiplier of two or three fold on that one thousand five hundred” [direct jobs]. 1,500 + (3 * 1,500) = 14,000.